my coworker and i recently were in houston for a conference. what does Houston boast besides being the birth city of beyonce? it just so happens that they've also got a little taste of atl in the mix with a new restaurant called state of grace by ford fry. so naturally, bey + ford fry food = yeah, we had to go. not only was the service and décor uber-typical of any atlanta fry restaurant, aka exceptional, the one thing I cannot get out of my brain is state of grace's burrata toast with grilled peaches, prosciutto and (i think) pesto. it melted off the plate and also in your mouth with perfect harmony of savory pesto, salty prosciutto and sweet, tangy peaches. so, of course as i still lie awake at night thinking of this dish, i had to recreate it. so here's my attempt, although, if you want the real thing, you're just gonna have to take a trip to the lone star state. bring your frizz-eez. side note: i know these are peaches, and i know this is october. but bear with me, 'cause they are still at my grocery store. you can sub some fresh figs to feel all "in season now" if you'd like. enjoy! cut your bread into about 1/4-1/2 inch slices and drizzle with olive oil and a little salt and pepper. set aside while you heat up a grill pan to medium high. cut peaches (or figs) in half and similarly drizzle with olive oil. grill peaches and bread slices for about 3-4 minutes on the pan and then slice into wedges once cool. 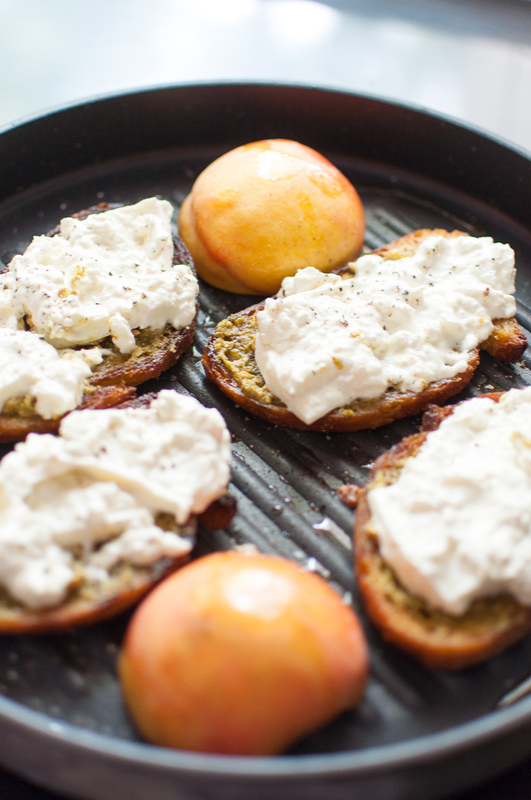 while peaches are cooling, flip the bread slices and spread some pesto onto each slice and continue to grill the bread so the other side can get nice and toasty. now, assembly time. the burrata will have a soft, but firm outer layer and be deliciously creamy inside, so you may have to scoop it onto the toast. Put a good dollop on each piece of bread and then start layering some peach slices and prosciutto. grill until the burrata is melted and the toast is crispy and golden. top with shredded basil leaves and a drizzle of balsamic glaze before serving warm. oh. man. enjoy!